Whether it is a horse that has been in the garage for many years, belonged to your grandmother, was made by an uncle or purchased at a car boot sale, a beautiful restoration or refurbishment, carefully carried out, will have you amazed that you owned such a wonderful heirloom. 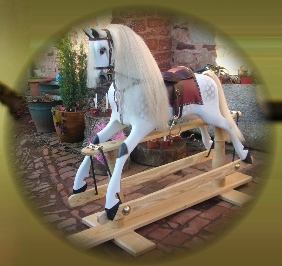 You can chose the type of paintwork and accessories for your restored horse, as if purchasing new. You may even wish to have it restored to it\'s original paintwork or finish. We can supply a step by step photographic record of the restoration on DVD with background music for £15.00. Prices vary from horse to horse depending upon the magnitude of the restoration. We would normally quote after seeing photographs of the horse, but we would prefer to inspect them personally so that joints etc., can be checked.